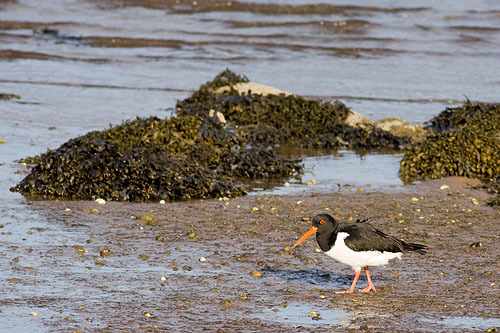 A common , resident , wader , around the Pembrokeshire coast . A gregarious Bird , with Black and white plumage and a stout red bill / a noisy bird with loud piercing calls . Breeding Resident / The oystercatcher is a large, stocky, black and white wading bird / It has a long, orange-red bill and reddish-pink legs / Eats Mussels and cockles on the coast / mainly worms inland / over the last 50 years, more birds have started breeding inland / Adults return to the same breeding and feeding grounds each year . Nest is a shallow scrape in shingle or sand / 1 Brood , 2 - 3 eggs , Incubation 25 days , Fledge 36 days .